Our Turkish (patented) company is already well known in the market. Currently we are taking more active steps in Europe, Central Asia, Iran, and Iraq. Azerbaijan is on a par with them, so we are participating in the exhibition. We want to offer the local market a quality, decent product. 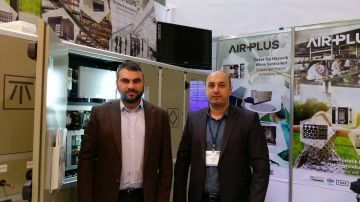 At the stand we demonstrate a device for restaurants, which eliminates odour and smoke, reducing it to 98%. If in similar systems, smoke and oil are drained into the sewage system, then our equipment turns everything into ashes, which is easy to clean without clogging up the water and sewage system. The device is equipped with a summer-winter system. Setting the desired mode in the cold time, you can economically heat the room. It has the ability to clean, condition the air in the kitchen. An important quality of this device is reliability. Working at a power of 200 watts, it is equipped with an automatic shutdown system. So you can avoid fires. In our production there are cleaning devices for hospitals, conference rooms, pools. All of them carry the necessary programs, functions, depending on the scope of use and are easy to use. We believe that our products are necessary for those who care about the quality of working conditions and the preservation of the environment. Caspian Ecology 2018 provides an ample opportunity to convey to the right people the right information about an important product, current projects. I hope that in the coming years the exhibition will become even more interesting and large-scale.